Home > Entranceexam > UPSEE 2018 Application Form - Last Date Extended! 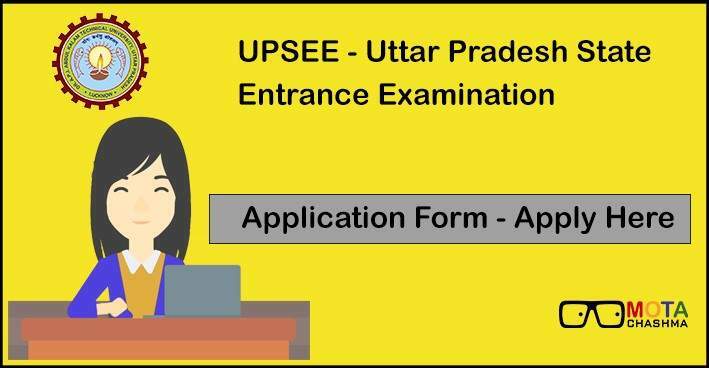 UPSEE 2018 Application form can be filled through online mode. The application process of UPSEE UG Courses has been started from 23 January 2018. The candidates willing to pursue the UG courses from Dr A.P.J. 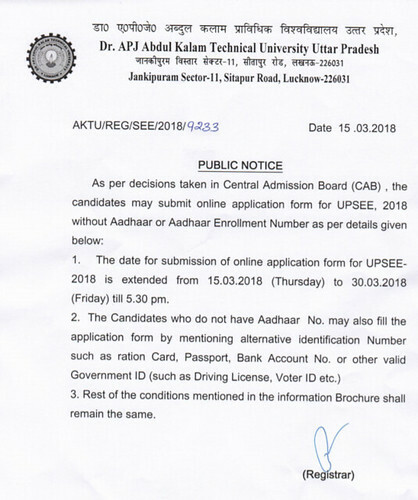 Abdul Kalam Technical University (AKTU), Lucknow are suggested to fill the form by following the link given below on this page. The candidates can fill the UPSEE 2018 Application Form before the deadline i.e. 30 March 2018. UPSEE 2018 Entrance Exam will be conducted in Pen & Paper and computer-based test on 29 April 2018 for B.Tech, B.Arch, and other UG courses. This page gives the complete guide to fill the UPSEE 2018 Application Form. Latest Update - Candidates are informed that the last date to pay the application fee is extended, Now candidates can pay the application fee until 1 April 2018. Last date to fil UPSEE Application Form is extended from 15 March to 30 March 2018 till 5:30 PM. The registration process of UPSEE UG Courses has been started from 23 January 2018. The candidates willing to pursue the UG courses from Dr A.P.J. 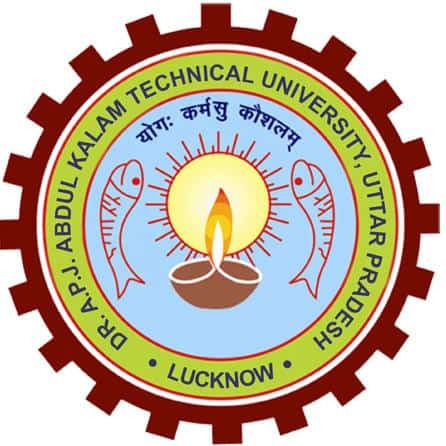 Abdul Kalam Technical University (AKTU), Lucknow are suggested to fill the form by following the link given below. The last date to fill the form is 30 March 2018. Hence, the candidates are suggested to fill and submit the form until the due date. Candidates can apply online by following the link above. The candidates must ensure that they meet the eligibility criteria to appear in UPSEE exam otherwise, it may be possible that the application of the candidates who are not fulfilling the criteria would be cancelled. NOTE: The candidate’s front should be facing the camera in a manner that full face shows. The photograph should be colored with the name of the candidate printed at the bottom of the image. The candidates are provided with the step by step guide to filling the UPSEE Application Form. The candidates are advised to follow each and every step of the application form to ignore any mistakes while filling the application form. Password of the candidate login. Communication Details -Then comes the details such as address, mobile number, email address etc. Qualifying Details - In this section, the candidates have to fill the examination details and also have to mention the subjects in the same. Choice Filling - At the end, the candidates have to choose paper as per eligibility, choice of city for examination centre etc. Photographs: Size must be between 4KB to 100KB (3.5 cm X 4.5 cm). Thumb: Size must be between 1KB to 30KB (3.5 cm X 1.5 cm). Signature: Size must be between 1KB to 30KB (3.5 cm X 1.5 cm). 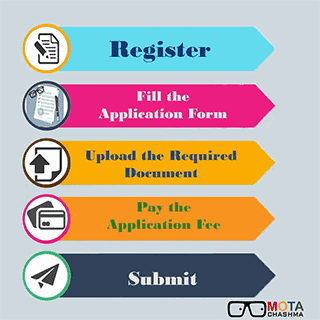 STEP 4 (Payment of Application fee): In order to complete the application form, the candidates have to make the payment of the application fee. The payment of application fee can be done through Debit/ Credit Card or Internet Banking. The instructions on how to make the payment of the application fee are described on this page below. STEP 5 (Submission): At the end, the candidates to complete the application process has to submit the filled in application form. After which the confirmation page will be generated. The candidates must download this page and keep it with them for future reference. The image of the candidates should be clear and must be in color passport size. The size of the photograph should be 3.5 cm X 4.5 cm in JPEG format. The maximum size of the image should not be more than 100 KB. The photograph should be without cap or goggles. However, spectacles are allowed. The examination fee for online application form has to be submitted online through Credit/ Debit Card/ Net Banking while submitting the UPSEE 2018 Online Application. The payment method by which the candidates can pay the application fee is given below. If the candidates opt to make payment through credit card/debit card, then they have to click on the appropriate link and make the payment. All VISA/Master cards are accepted. Candidates have to be ready with their credit, debit card details. The payment in this mode can be done on the same day. Candidates are required to note the transaction number for all future correspondences. To submit the UPSEE Application, the candidates need to click on the "Submit" button. After clicking on the submit button, the candidate will get a review page mentioning all the crucial information filled in by the candidate. Candidate must check all the information on Review Page. Candidate must click on ‘Edit Application Form Data” Button to change or modify the information provided in Application form. The candidates can click on the Final Submit after satisfying all the entries of the application form. Once the UPSEE 2018 Application form is submitted the candidates can proceed to generate the “Confirmation Page." Candidate must take a printout of this confirmation page and keep safely for future reference. On submission of application, a registration number will be generated. Candidates have to note this registration number for all future correspondences. In case the student has forgotten the UPSEE 2018 Application Number then the student should visit the UPSEE 2018 Official web page and click on Forgot Registration Number, the student will then have to provide some basic details to retrieve the UPSEE Application Form Number. In a case of any difficulty in filling the online application form, candidates may call at the helpline number or email with the subject line "Seeking Help". In case you have any question about UPSEE Application form 2018, write to us in the comment section below.